The story of Ruttie and Jinnah could easily be translated into a screenplay. It has all the elements to make a compelling film—the tall and stately Muhammad Ali Jinnah so enigmatic in his quiet resolve to be the most powerful man falls for the beautiful and determined Ruttenbai Petit in her diaphanous saris and scandalous blouses to whom the fight for freedom is as thrilling as her dangerous romance with Jinnah. 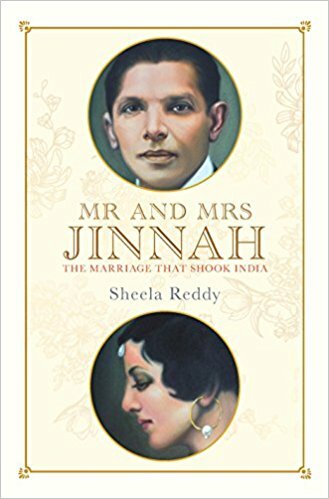 From the forbidden romance and Ruttie’s conversion to Islam, to the elopement and the consequent reality checks about love, life, nationalism and politics, Sheela Reddy’s Mr And Mrs Jinnah: The Marriage That Shook India has it all. An unlikely couple, together they shocked and dazzled. Where Jinnah was a slow flame, gradually gathering strength, Ruttie was a crackling fire. They were written about in gossip columns, spoken about in hushed disapproving tones and caused many a conservative Muslim and Parsi leader to have many many cows. Little by way of Jinnah’s personal life is known considering he never wrote a memoir or an autobiography and kept his correspondences short and devoid of colour and details. Mr and Mrs Jinnah, therefore comes as a heartwarming story of a man largely vilified in India and whose personal life has always been put together from remembrances of others. Reddy’s book focuses on the time period of Jinnah’s life after he had established himself as a successful barrister and a staunch nationalist, and before he was seen as the creator of Pakistan. Mainly culled together from Ruttie’s letters to Sarojini Naidu’s daughters—Padmaja and Leelamani—with whom she had developed a great pen friendship, the book is a window into the raging, yet tumultuous, social lives of Bombay’s upper crust and, later, the effect of the nationalist movement on them. We begin with a sixteen-year-old Ruttie, dubbed the ‘flower of Bombay’. An enviably fashionable figure and sought after by many eligible young men, she chose the much older Jinnah over all her suitors. She was allowed access to him like no other. He allowed her to tease him and joke with him. On rare occasions, she could even make the austere Jinnah relax, stretch his legs and let his charm flow in the form of stories and anecdotes. She enjoyed that little power she had over him. When the knowledge of this match got out, it was promptly forbidden by her father, the rich baronet Sir Dinshaw Petit. Defiance from his daughter, then 18, came in the form of a secret courtship, or lack thereof (of which we mostly read in Ruttie’s account), and a quiet wedding at Jinnah’s Malabar Hills home in Bombay. On the big day, Ruttie ran away from home with nothing but an umbrella and her dog, Arlette, for company. There was a handful of his friends in attendance and he forgot to procure a ring for his bride. Although, taken aback by the scant arrangements, Ruttie devoted herself to him anyway. With very little support from either religious community, the young couple was ostracized. The story goes that her father upon reading the news of the wedding in the newspaper fainted, woke up and slapped a charge on Jinnah for kidnapping his daughter. According to the material available to Reddy, the charge prompted the newly-wed bride to stand up in court and declare: ‘Jinnah has not abducted me: in fact, I have abducted him’, a declaration that earned Ruttie the faint smile from Jinnah she so craved. However, the crumbling of the illusion that Ruttie had created in her head about her husband began slowly but almost immediately after the wedding. Reddy writes about Ruttie’s disappointment at the lack of passion in the bedroom from Jinnah, whom she had seen make many a passionate speeches, and at the long hours spent waiting for him to return from his workplace. She busied herself in making his life more comfortable and tended to his meals in which he showed very little interest. Her expectations of fully drawing out the normally reticent Jinnah, or ‘J’ as she called him, were never met. Jinnah, however, for his part, seemed to have embraced domesticity more than he had ever before. ‘He began to return home early, looking forward to spending the evening alone with Ruttie’, writes Reddy. As the pull to politics increasingly won the battle for his attentions, Ruttie became more and more isolated, cut off as she already was from her family and the Parsi social circle. The story of love that had begun as a fairy tale had turned into a tale of loneliness and frustration. Accustomed to spending her evenings at the theatre or the club, it was strange for the flower of Bombay to stay in night after night with Jinnah who, instead, looked forward to quiet evenings with Ruttie while he pored over every newspaper he could find. The book continues to chronicle the growing tensions between the two even as the politics of India changed in the background and the national movement took a dramatic turn away from Jinnah’s hands and right into Gandhi’s, threatening to send the former into a political limbo. Reddy expertly weaves a story around the letters she stumbled upon at the Nehru Memorial Museum and Library. With very little material to work with, she tells a rich story of this once ‘it’ couple whose lives were intertwined with the politics of their times. As much as one would like to believe that this demystifies the inner workings of Jinnah’s mind, Mr and Mrs Jinnah is about Mrs Jinnah—a woman with a lyrical writing style and an ability to express her emotions without ever directly talking about her problems. The story is of a woman who doused her fire and passion to strengthen her husband’s. Strikingly, my time spent reading Mr and Mrs Jinnah coincided with my fresh interest in a TV show about the life and times of Zelda Fitzgerald, wife of American author F. Scott Fitzgerald. It’s astounding how much of Ruttie I saw in Zelda. These were two women on entirely different continents mirroring each other’s lives. Both were born in 1900 into politically important families and grew up to be the belles of every ball. Both had a habit of rebelling against their families. Ruttie was married by 18, Zelda by 19 and both to people their fathers disapproved of. While Ruttie’s husband had political aspirations, Zelda’s had literary ones. Both devoted themselves to their husband’s goals, to the detriment of their own fire and talent. Neither had much patience with motherhood either. Both died lonely and tragically. attention, raged over his indifference, bloomed under his affection and just poured her heart out to these two girls and their mother, the only woman not of her age she felt connected to. As for Jinnah, he was single-mindedly devoted to one cause—political justice for Indian Muslims. His unemotional treatment of their marriage created a rift that eventually and inevitably led to separation. Near her 29th birthday, Ruttie died of an overdose of pills believed to have been morphine. On hearing the news of his estranged wife’s death, Jinnah, for once, is said to have succumbed to tears.